I am fascinated whenever I see this type of beverages vending machine, especially the Nescafe coffee vending machine which dispenses beverages. Even my eldest daughter thinks I am a bit strange. We came across one at Palm Square, Central Point Shopping Complex last weekend. While waiting for our princesses to window shop at their favourite shops, my better half offered to get me a drink from this machine because he knows me well. This machine accepts both coins and notes..slotted in RM1.00, we waited for the machine to process our drinks..
can you see the 3 red lights ? When the forth lights appeared means the drinks is done and ready to collect from the glass box below. Here is a cup of hot Teh Tarik, I wanted a cup of hot coffee but there's none only cold ones available. 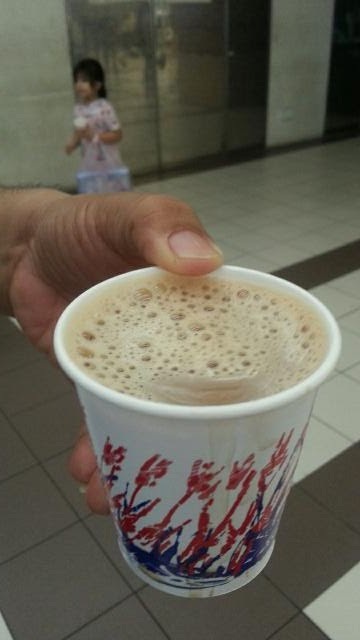 This Teh Tarik is a bit sweet, the paper cup is a bit small and thin, too hot to hold around the cup as well, a bit difficult to handle. 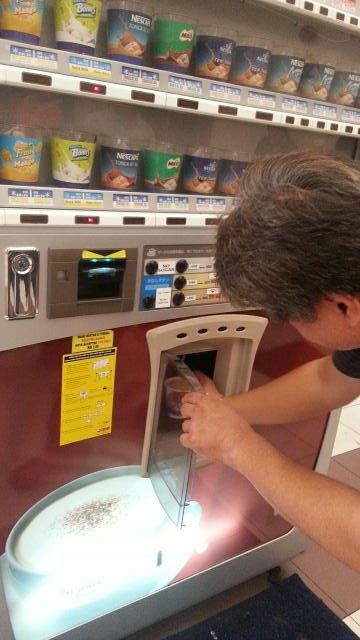 Hope there will be some enhancements when I buy a drink from this machine again. There are heaps of vending machines in Japan. You'll love it! 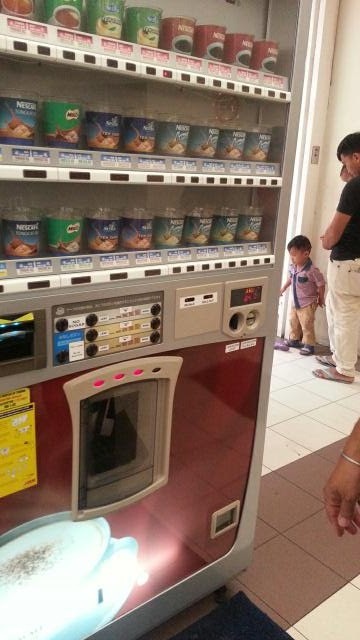 I used to have a Nestle vending machine in my office too. It was provided by Nestle (our client) and it had Nescafe, Teh Tarik, Milo inside. It's the small one about 60 cm x 60 cm for use in offices. You have to use your own cups. I've seen this around also. The Teh Tarik is always really sweet, I don't quite like it, but the others are alright. The cappuccino is decent for the price. 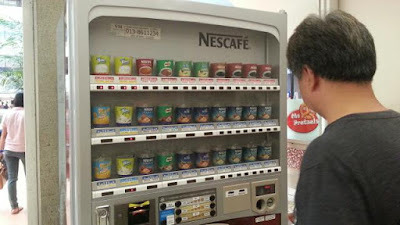 I always buying milo ping from that vending machine is cheaper than kopi tiam. We have a coffee vending machine at the hospital I work at. It has thin cups too and is hard to hold hot coffee. But it tastes pretty good! 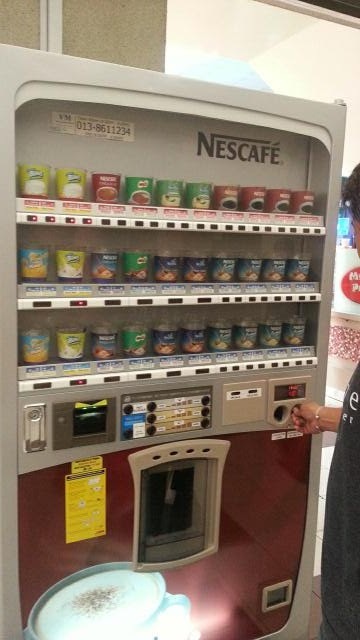 I thought the machine dispenses tin cans or bottles or paper packet drinks but it dispenses the beverage into cups instead. Not many such machines in Kuching. Haha so this is your weakness. 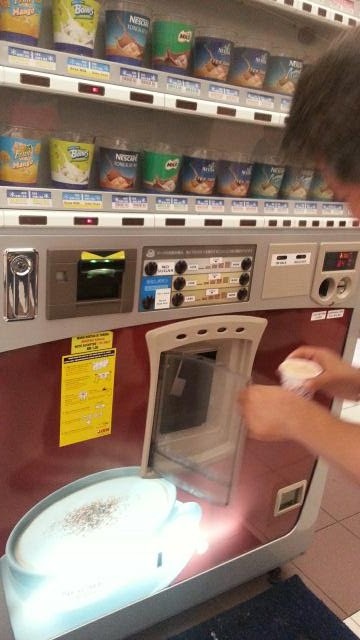 :) But I must say this vending machine is so attractive with the many choices of drink.